Tenants are right to ensure that they are renting from reputable landlords and letting agents that take the appropriate steps to protect a tenant’s money – like using a government-backed tenancy deposit protection scheme. 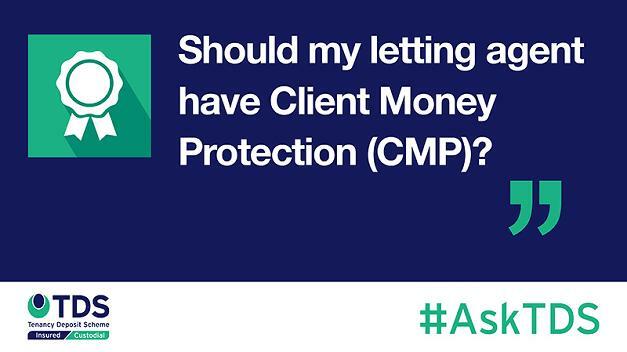 Another qualification that tenants should look for in an agent is whether they have Client Money Protection (CMP). Essentially, CMP may reimburse both the landlord and the tenants if an agent goes out of business or misuses client money. Client money can include rents, deposits and funds for maintenance work. CMP isn’t currently enforced in England, but we expect that to change later this year. Agents who are not enrolled in a CMP scheme when it’s mandatory will be operating unlawfully. With the creation of the Legal Enforcement Authority under the lettings fee ban, we expect vigorous enforcement of this law – far more so than we’ve seen with other laws over the last decade. Letting agents who subscribe to a CMP scheme can, however, set themselves apart from competitors, making them more desirable to both landlords and tenants. Owned jointly by TDS and Propertymark, Money Shield is a CMP scheme available to UK lettings agents. It offers a straight-forward and cost-effective CMP solution, allowing agents to secure robust protection for their clients without membership of a professional body. TDS has worked with leading industry partners including Propertymark for more than 15 years to give agents, landlords and tenants peace of mind that their tenancy deposits are protected, so moving into CMP is a natural evolution. We already have robust systems in place to properly protect tenancy deposits, and – working with recognised bodies to create Money Shield – we can now offer full protection for the private rented sector (PRS). You can find out more about Client Money Protection and Money Shield at www.money-shield.co.uk. Money Shield is a Client Money Protection (CMP) scheme, available to all UK lettings and estate agents. It offers a straight-forward and cost-effective CMP solution, allowing agents to secure robust protection for their clients without membership of a professional body. Money Shield is owned jointly by Propertymark and The Dispute Service (TDS), administered by Propertymark and operated in association with The Property Ombudsman (TPO). Money Shield is the trading name of Money Shield Ltd.